I'm conflicted. That's because I love and hate this time of year. As I'm sure all of you know, we're about to celebrate another year of "Lutheran Schools Week" at our Lutheran Day Schools around the country. "National Lutheran Schools Week" is January 21st-27th, 2018. National Lutheran Schools Week provides our network of nearly 2,300 LCMS preschools, elementary schools and high schools with the public opportunity to proclaim and celebrate God’s work among us in Lutheran schools. We thank God for the opportunity to provide excellent academic preparation for the children we serve. We are most grateful for the opportunity to share Jesus’ amazing love with children and their families. National Lutheran Schools Week gives us an opportunity to proclaim these great blessings within the communities we serve. Our schools are amazing incubators for faithful witness of God’s love for us through Christ by teachers and students alike. The theme is pretty crystal clear: "It's Still About Jesus!" (Hebrews 13:8). Great! Sign me and my kids and nephew up for that! Is there ANYTHING about that week's entire schedule that screams "Lutheran!" let alone that "It's Still About Jesus!" which is always more important than any unique denominational differences that are of benefit to believers? I mean, the ONLY time that anything even remotely Lutheran in mentioned is when it says they are going to honor "Lutheran Braille Workers" on the day of the week when the entire schools honors "The Religious Service Community" and "Superfamilies" instead of our Lord and Savior! Lutheran Braille Workers, huh? Seems appropriate given what I want to say today. Matthew 15:13-14 (ESV) He answered, "Every plant that my heavenly Father has not planted will be rooted up. Let them alone; they are blind guides. And if the blind lead the blind, both will fall into a pit." Luke 6:39 (ESV) He also told them a parable: "Can a blind man lead a blind man? Will they not both fall into a pit?" The Pharisees considered themselves the spiritual guides for the common Jew, but since these self-appointed guides were themselves blind to Jesus' teachings, both they and their followers were doomed. Jesus teaches the disciples to judge mercifully and to lead faithfully. Please understand that it's within that same spirit that I continue writing this piece today. Yes, it will be hard-hitting at times, but it's only out of love for my dear brothers and sisters who continue to insist on "a way that seems right to a man, but its end is the way to death" (Proverbs 16:25). For that reason, we should always approach a case like this by "speaking the truth in love" (Ephesians 4:15), and never pull our punches, especially when it comes to catechizing our youth. Mark 9:42 (ESV) Whoever causes one of these little ones who believe in me to sin, it would be better for him if a great millstone were hung around his neck and he were thrown into the sea. Luke 17:2 (ESV) It would be better for him if a millstone were hung around his neck and he were cast into the sea than that he should cause one of these little ones to sin. Personally, I find it a sad state of affairs when a Lutheran Day School with such rich history like the one my kids attend CONSTANTLY does whatever it can to distance itself from that heritage and history while embracing the "doctrines of men" (Colossians 2:22) from other heterodox faiths instead. Where is the focus on Jesus Christ too!?! Outside of the absurd "Jesus Is My Superhero!" theme of the school for the year (please read Rev. Matt Richard's book Will The Real Jesus Please Stand Up? 12 False Christs for specifics as to why this common label used to teach kids about our Lord and Savior is both harmful and ridiculous), I don't see ANYTHING planned that specifically focuses on CHRIST'S WORK FOR YOU, FOR ME, AND FOR THE WHOLE WORLD but a ton of activities, events, and teachings on YOU/ME/US FOR CHRIST instead! "Works Righteousness" anyone? THIS is what I'm paying thousands of dollars a year for!?! Can someone please tell me why these keeps happening with reckless abandon despite persistent pleas and warnings to rethink things year after year? Sure, I suppose I can choose to have my kids go somewhere else. No one's forcing me to send my kids there. I get that. I guess I just feel like we can continue to try to be faithful witnesses about what it is we should all believe, teach, and confess within those four walls on a daily basis for as long as they're allowed to be students there, letting the Lord be the One who determines the outcome (1 Corinthians 3:7). Forgive my animosity, but I have been fighting the good fight against this sort of thing at this school (and the church that's affiliated with it) since 2011 -- that's 7 long years now -- and it only seems to be getting worse. Every "small victory" (or what I perceive to be a "small victory") ends up leading to another "major transgression" like this. Now, you might be wondering why I'm so up-in-arms over this. "What's the big deal?" you might be thinking, right? Well, I'll tell you. For starters, I'm just saddened by the fact that this school and it's staff have allowed all the Lutheran essentials to go right out the window (and so soon after we all celebrated the 500th Anniversary of the Reformation too!). What began with officially changing their name from "Trinity Lutheran School" to "Trinity Christian School" (so that they could attract more Christian families and students) has only led to allowing the many heterodox (a.k.a. non-Lutheran faiths) to influence EVERYTHING there top to bottom from the curriculum on down to the philosophies behind each activity, event, and lesson carried out. As a result, they're now way more "Evangelical" or "Wesleyan" I would say than "Lutheran" for sure! I know that a majority of people simply don't care about one's denomination anymore, because they don't understand that a person's confession matters thanks to "Gospel Reductionism" that has actually destroyed unity in the faith (Ephesians 4:4-6). "Let's celebrate all of the Superheroes among us!" WHY CAN'T WE CELEBRATE CHRIST AND HIS GIFTS FOR US? "Each day we'll learn about all of the helpful and generous people in our communities who care for us, keep us safe, and support those in need." WHY CAN'T WE LEARN ABOUT JESUS AND ALL OF THE HELPFUL AND GENEROUS THINGS THAT CHRIST HAS DONE AND CONTINUES TO DO FOR US TO CARE FOR US, KEEP US SAFE, AND SUPPORT US, AND HOW THE LORD'S DOCTRINE OF VOCATION CALLS EACH OF US TO LOVE AND SERVE HIS NEIGHBOR? "We'll dress as our favorite SUPERHERO or in RED, WHITE, and BLUE!" WHY DO WE INSIST ON TEACHING OUR CHILDREN AND GRANDCHILDREN (THE LITTLE ONES ENTRUSTED TO OUR CARE) THAT JESUS CHRIST IS THE SAME AS SPIDERMAN OR BATMAN OR THAT WE CAN BE A SUPERHERO JUST LIKE JESUS? WHAT'S UP WITH THIS "AMERICANIZED" VERSION OF CHRISTIANITY TOO (A.K.A. "POLIGION" AS I'VE CALLED IT)? "Our preschoolers will lead the all-school devotion that day"
WHY CAN'T THE PASTOR, PRINCIPAL, OR TEACHER LEAD DEVOTION? "Superfamilies will construct banners that will be hung in Trinity Church that express our thanks for the congregation's support." WHAT ARE "SUPERFAMILIES" AND WHY WOULD WE EVEN TEACH THIS CONCEPT TO CHRISTIAN STUDENTS IN A SUPPOSEDLY "LUTHERAN" SCHOOL AND WHY NOT JUST MAKE SACRAMENTAL-THEMED BANNERS TO HANG IN CHURCH THAT EXPRESS OUR THANKS TO GOD FOR CHRIST'S CHURCH AND THE GIFTS WE REGULARLY RECEIVE THERE? "3rd and 4th grade are devotion leaders." Now, I could go on and on, but I honestly can't stomach anymore. Did you notice the CONSISTENT theme though? Pop Quiz: Was the focus squarely on Jesus Christ? No, no it wasn't! Instead, the focus is placed squarely upon Me, Myself, And I or You, Me, And We, which I don't have to tell you is a disastrous approach to Christian education. Let's dig a little deeper and get a little more specific though. 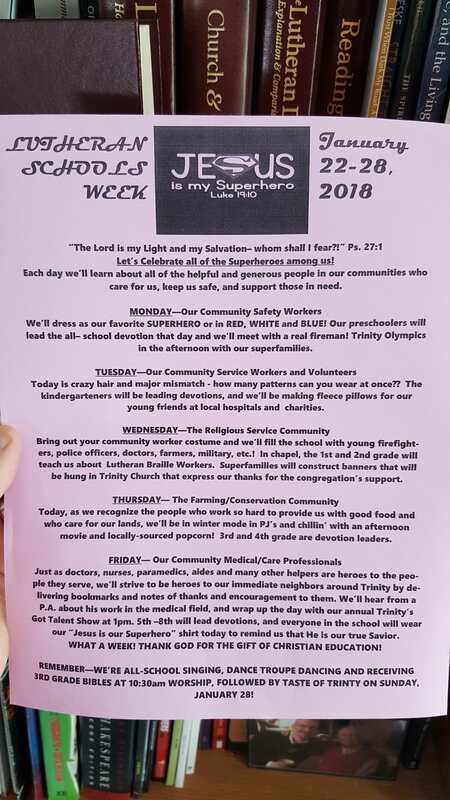 Friends, this reads more like a "Social Justice Warrior Schools Week" fueled by "Moral Secular Humanism" (or "Moral Therapeutic Deism") than a "National Lutheran Schools Week" fueled by anything truly Biblical and Christian. I don't think I'm being cynical or unfair to point out that what it all seems to amount to is a week-long celebration of ourselves and how we want to "thank God" for each other and for all the important jobs He's given each of us to accomplish for Him in this life (because He does need our good works after all). Sounds more like a Christian education that's being centered around the "Sacramental Entrepreneur" stuff rather than around Jesus Christ, the cross, the Gospel, the Word, and the Sacraments. Here's the thing: THERE'S ABSOLUTELY NO EXCUSE FOR ANY OF THIS! There are plenty of FREE RESOURCES available online promoted and published by the LCMS and CPH that a school like this can use to develop a schedule for National Lutherans Schools Week so that's what makes this even more maddening for me as a parent who's paying thousands of dollars for his two children to have their Lutheran education (first taught by me at home) reinforced day-in-and-day-out at school without me having to worry about "deprogramming" them when they get home and tell me about the apostasy, blasphemy, heresy that they've been exposed to. The LCMS website even has links to "Worship Resources" and "Theme of the Day Posters" too! In other words, all of the work has been done for overworked Teachers and staff. All they have to do is download, save, print, distribute, and execute! It's really that simple and then none of this would be an issue. That would be too easy though and who wants to do things God's way anyway? Why be so "bland" and "boring" when you can be "creative" and "exciting" and come up with your own ideas instead? Taking cues from the LCMS and CPH reminds me of me Grandpa's church and his time has come and gone. You have to be the new to receive the new from God! Eureka! That's the ticket! Now that's what I call distinctly "Lutheran" teaching for sure! This is what should be taught during "National Lutheran Schools Week" at ALL Lutheran schools nationwide, shouldn't it? Once again, Teachers and staff don't need to do any work whatsoever except download, save, print, distribute, and execute! I'm sorry, but there are NO EXCUSES! If you're a supposedly Lutheran Day School and you're calling next week's calendar of events "Lutheran Schools Week" too, then you should be using these materials, some combination of them or, at the very least, you should create a week's worth of activities and lesson plans that are VERY SIMILAR to the above outlines provided by the LCMS and CPH. It's so simple really and that's why I'm frustrated. Sadly, while I continue to pray for them, continue to express my concerns, and continue to hold out hope, it's becoming increasingly obvious that there may be no turning back. I've patiently tried to pick my spots to voice my valid concerns over the past 7 years and it has only fallen on deaf ears. I feel like I write this same article each and every year too, but this year seems to be the worst yet. What's equally disappointing and heartbreaking is that the people responsible genuinely love God and are some of the most sincere and well-meaning Teachers that I know. However, we all know that sincerity does not equal truth and "the road to hell is paved with good intentions." I know that the Teachers and staff are very hard-working and dedicated servants, and that's why I should always pray for them regularly and try to support them in their mission. I'm ashamed to admit that it's becoming harder and harder for me to commit to doing that whenever I see this repetitive nonsense. I will continue to do what I do though. This is my small way of way of doing what I can beyond prayer and beyond the one-on-one private discussions. Holding them accountable and attempting to correct them gently each and every time something like this occurs is what we are expected to do and it's what I expect others to do for me when I am out of line too (Proverbs 27:5; Psalm 141:5; Ecclesiastes 7:5; Luke 17:3; 1 Timothy 5:1; 2 Timothy 4:2; Ephesians 4:5). Perhaps those of you reading this can join me in praying for them as well. Most importantly, our curriculum centers around the Word of God. The Fruit of the Spirit is the based upon which all other subjects are built. We don't have to implement a "character" program, we ARE a character program! Setting that aside, we need to ask a very important question. All of this which has been reported today begs the simple question: Why even call it "Lutheran Schools Week" then if you're not going to be intentional about the key benefits of a Lutheran parochial school versus others? Ironically (or maybe not), the answer is the same one given to the question: "Why does a church call itself Lutheran when a majority within the congregation are Lutherans-In-Name-Only?" My dear friends, I strongly believe it has to do with Pollyannas and Peter Pans within both institutions. If you're a regular in these parts, I'm sure you're starting to think that I'm always exaggerating and am so ornery all the time. Not so. I laugh quite often. I'm a goofball at home with my wife and kids (because I'm a big kid myself!). I like to have fun and don't take myself too seriously. However, I do take God's Word seriously and I take my faith seriously too. That's not to suggest that anyone who may not be exactly like me is the complete opposite or a heretic let's say, but it's only meant to help try to explain where I'm coming from in writing a piece like this. Unlike most Christians today (particularly here in my neck of the woods), I believe that one's confession of "the faith that was once for all delivered to the saints" (Jude 1:3) matters significantly and that should be taken quite seriously too. Maybe it has to do with my Non-Denominational and American Evangelical past and how it almost shipwrecked my faith. Whatever the reason, I'm zealous for consistency when it comes to the truth and to doctrine and practice. Call me crazy, but I don't think we should be ashamed of who we are and what we believe in. It didn't bother me as much in year's past, but with everything else going on in Christ's Church today (and mainly within the LCMS in recently months) I've had enough. When did things get this way? When did it start? When will it end? Will it ever end? Those are the questions I have. Maybe I already have the answers. When a Lutheran Day School that's been around for over 100 years decides to change it's name by removing "Lutheran" and replacing it with the more community-friendly "Christian" instead, that one small and seemingly insignificant compromise was probably the beginning of the end. We weren't around for that one, but I'm sure most parents were swayed by the argument that changing the school's name from "Lutheran" to "Christian" will "attract the attention of more non-Lutheran parents in the local community who want a quality Christian education for their children regardless of the denomination they belong to." Fair enough. I get it. Plus, the plan could have been to get them in the door so we could catechize and convert them to Lutherans. Today, the school boasts less than 100 students spread out from Pre-K to 8th Grade and each class is comprised of Christians from the LCMS, ELCA, Baptist, Catholic, Evangelical, Non-Denominational, Pentecostal, Presbyterian, and even Wesleyan. In other words, the strategy worked...if the original plan was to attract these Christian children and their families from the local community so that you could eventually expose them to distinctly Lutheran teaching throughout the course of the school year. Unfortunately, this is not the case at all, and the "Christ-centered education" that's promised is replaced with a HEAVY DOSE of "Moral Therapeutic Deism" teachings with some Moral Secular Mumanism sprinkled on top just for good measure since the "Social Gospel" and "Social Justice Warriors" is what it's all about nowadays I guess. The worst part is that no one there -- Teachers, staff, and majority of parents -- even sees any of this as being a real and serious spiritual problem. Lutheran teachers are role models for their students. This is a great and awesome responsibility. Teachers stand in the same sinful condition as their students, in need of a Savior. Through their actions, teachers can demonstrate the joy of forgiveness, grace and mercy that is afforded to us by our Lord and Savior. Apart from parents, there is no more important role model for students than a joyful, faith-filled, forgiven Lutheran teacher. We can all celebrate the fact that our schools will remain faithful to the teachings and confessions of The Lutheran Church-Missouri Synod. We will not be led away by the diverse and strange teachings being imparted in our world today. Our God is faithful, and we will remain faithful to Him. We stand fast in the knowledge that our Lord and Savior is the same yesterday and today and forever. That’s the reason for our celebration! The reality? What I see is a week that simply celebrates the system of education itself by highlighting and showcasing the students and all the non-Christian things they've learned at a Christian Private School as opposed to highlighting and showcasing Jesus Christ and His free gifts offered and delivered to us through the Lutheran Church let alone a Lutheran school. Not good. The problem stems from the fact that the school is merely mimicking the church across the parking lot where the only thing distinctly Lutheran about it is the name on the church sign out front, which they haven't disposed of (yet, anyway). Correct me if I'm wrong, but these are kids who are at the age where they're all going through Confirmation Classes right now. What kind of catechesis is taking place (if any)? There are some pretty basic truths being ignored as evidenced by the "Do Better! Do More!" and "YOU/ME/US For Christ!" brand of Christianity being proclaimed on a daily basis and being highlighted during this special week. Not to be a pain here, but how can they say they're looking forward to "having a great week celebrating the gift of Lutheran Schools" when they never highlight anything at all that is distinctly Lutheran!?! Will there be a single mention of Martin Luther, the Reformation, the Luther Rose, our Confessional nature, the importance of the Liturgy containing both Word and Sacraments, and/or an encouragement for Lutherans who attend the school to be unashamed about being Lutheran as they head out into the world to fulfill their various vocations in life? I sincerely doubt it. Bottom line? This school has an identity crisis. I pray the Lord snaps them out of their spiritual amnesia soon. If not before my kids finish their time there as students, then perhaps someday before my neighbor's kids begin going there. I'd like to believe there are still Lutheran Day Schools out there that aren't ashamed to be Lutheran. I'd like to encourage those schools and preschools to celebrate next week by sharing events and photos of this celebration. Feel free to reference them in the Comments Section below. If the photos will be shared on social media, please use the hashtags #LuthEd, #NLSW18, or #NLSW so that they can be referenced online. In a Lutheran layman's terms, our Lutheran Educators across the country should be working faithfully to develop young Christians (and preferably young Lutherans), not "Social Justice Warriors" where things like "community" and "self" are emphasized more than Jesus Christ, the Gospel, the Word, and the Sacraments.